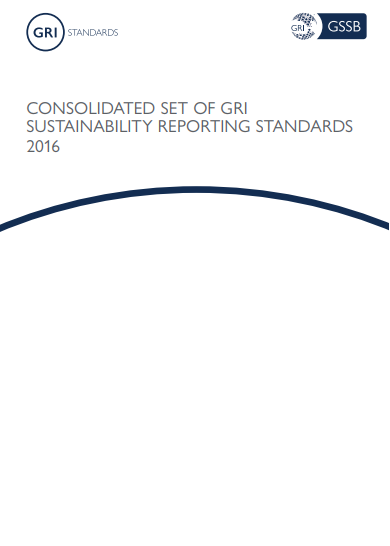 string(1142) "Resource Centre > Uncategorized > Consolidated set of GRI Sustainability Reporting Standards 2016"
This Standard, issued by the Global Sustainability Standards Board (GSSB), contains the set of 36 GRI Sustainability Reporting Standards and the GRI Standards Glossary published in 2016. The full content of each Standard has been incorporated, including the original formatting and page numbering. an organization that intends to use selected GRI Standards, or parts of their content, to report on impacts related to specific economic, social, and/or environmental topics (e.g., to report on emissions only). GRI 101 can be used by an organization of any size, type, sector, or geographic location.